On the basis of its fiscal solvency in five separate categories, Massachusetts is ranked 48th among the US states for its fiscal health. On a short-run basis, Massachusetts holds between 45 percent and 111 percent of the cash needed to cover short-term obligations. Revenues cover 96 percent of expenses, and net position decreased by $319 per capita in FY 2015. On a long-run basis, a net asset ratio of −1.84 points to a heavy reliance on debt and large unfunded obligations. Long-term liabilities are 239 percent of total assets, for a per capita long-term liability of $9,919. Total primary government debt is $28.43 billion, or 6.9 percent of personal income, nearly twice the average in the states. The best score for Massachusetts was for trust fund solvency. On a guaranteed-to-be-paid basis, unfunded pension obligations are $115.75 billion, or 28 percent of state personal income. OPEB is 4 percent of state personal income. 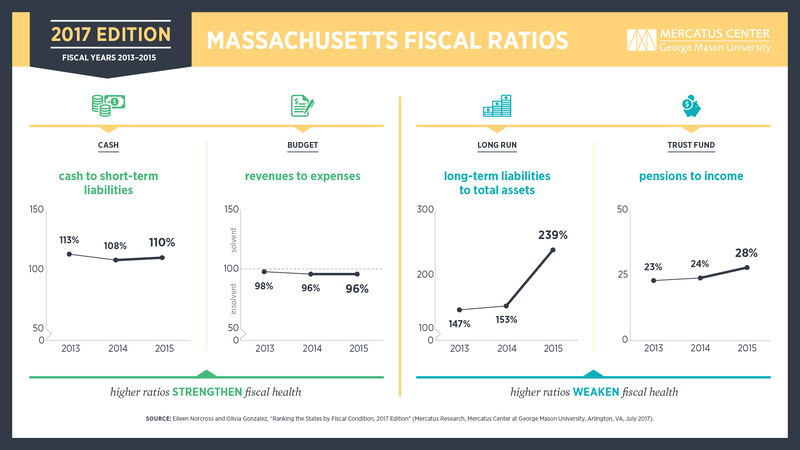 For a complete explanation of the methodology used to calculate Massachusetts's fiscal health rankings, download the full paper and the dataset at mercatus.org/statefiscalrankings . To read all our work on Massachusetts, go to mercatus.org/states/massachusetts .